When it comes to inclusion, we try to cover all the bases as a community. 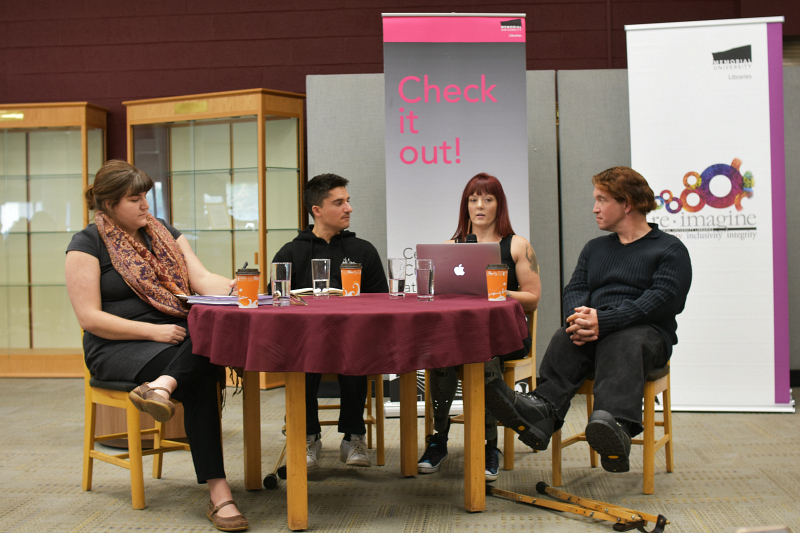 There are so many areas and perspectives that need attention, and mountains are not going to move overnight, but I am excited to say that some wonderful things are happening in our province with regards to accessibility in the arts. It is encouraging to know that people (like my dear friend, Paul Power) are committed to creating diverse and accessible projects, not as some charity outreach mission, but as responsible citizens who are committed to representing the real world - a world that includes persons with disabilities. 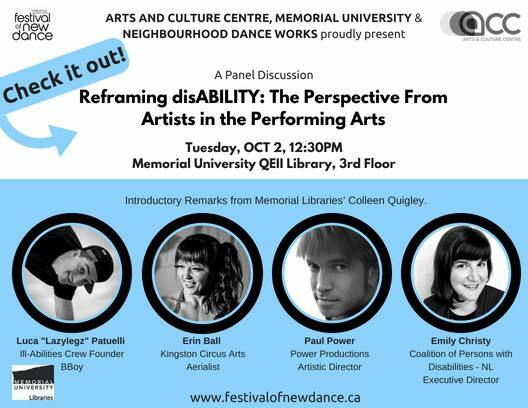 This afternoon, I attended a panel discussion titled 'Reframing disABILTY: The Perspective From Artists in Performing Arts'. 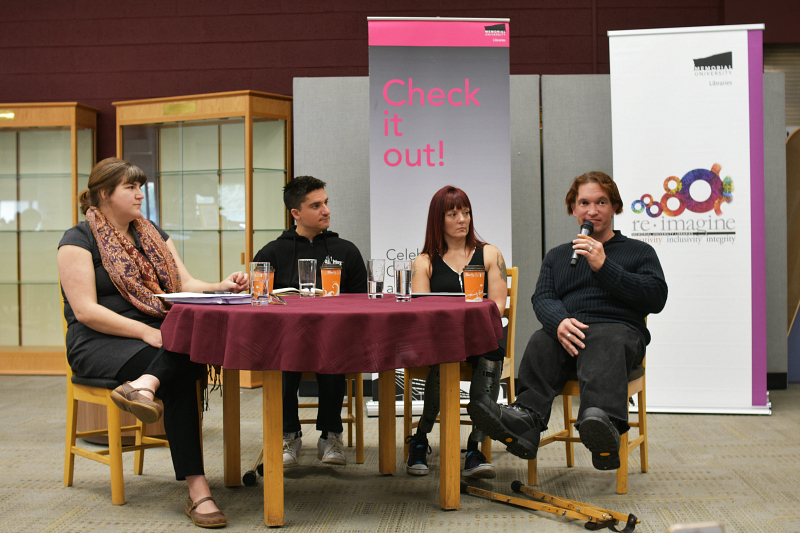 The panel included three professional performing artists all living with a disability - Luca 'Lazylegs' Patuelli, Erin Ball, and Paul Power, and was moderated by Emily Christy, of the Coalition of Persons with Disabilities - NL. The artists each described their own experiences and various triumphs overcoming adversity in their respective roles. Their stories are both inspiring and motivating, and resulted in an important conversation around inclusivity, accessibility, and overcoming extraordinary challenges. Paul Power has spent the last 25 years working as a writer, actor and director. Born with a disability requiring the use of crutches and leg braces for mobility, Paul has a long history in raising awareness and understanding about disability issues through his work as a playwright, columnist, director, actor and community leader. Paul is one of 13 deaf, disabled and MAD art leaders from across the country who participated in the National Arts Centre 2016-2017 cycle. The cycle was a year long process that explored diversity in our national theater scene and how artists can work to expand and strengthen disability arts in Canada. Paul is committed to applying what he's learned during this process to projects and initiatives in his own community as well as other areas of Atlantic Canada. Paul currently has his own production company, Power Productions, based in St. John's which produces and advocates for theatre projects focused on disability, deaf and MAD arts. Paul talked about his experience as a "disabled actor" and auditioning for roles unrelated to his disability. 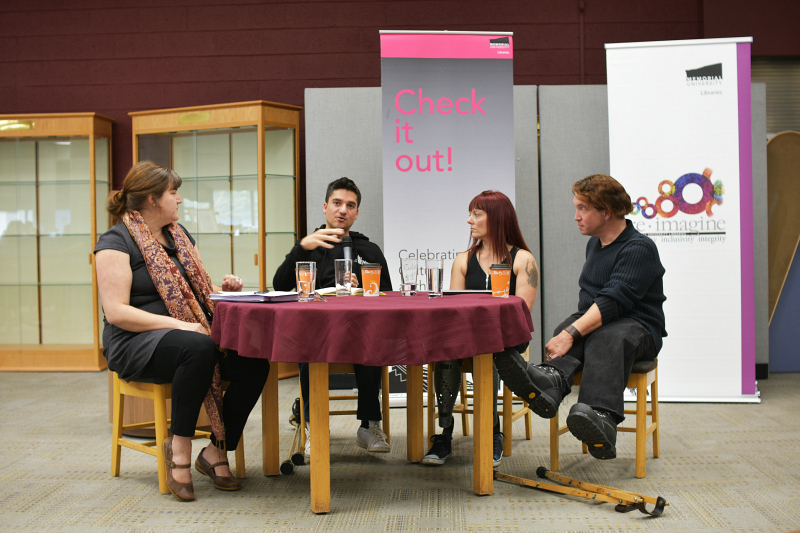 He spoke about how he always felt like the only one with a disability in the theatre world here in Newfoundland, and how that is what led him to create plays that represented persons with disabilities on the stage. Paul said, "I think another factor of inclusion is doing by seeing, and from a theatre perspective, challenging directors and casting agents to broaden their horizon in their casting. It's not good enough just to say 'We welcome everybody'. What I've learned through our activities is that to make change you really have to go in there and pull people out to insight change because it's not going to happen on its own." Erin Ball is a circus artist from Kingston, Ontario. Her disciplines include aerial silks and trapeze, both solo and duo, wheelchair acrobatics and aerial wheelchair, flexibility and hooping. Erin is also experienced with aerial hoop, partner acrobatics and hand-balancing. She took a year off in March 2014 due to a life changing event that resulted in the loss of her lower legs. She has since returned to her passion of training, coaching and performing, and loves adapting and creating new and different ways of executing her skills. Erin loves to move and to connect with others through movement and play, and she has worked with many diverse groups of people. She developed a workshop and manual in 2017 called 'Flying Footless' - a course for aerial coaches working with amputees. She recently hosted the first amputee circus camp week with Kingston Circus Arts. Erin is involved in many artistic projects, including her company, LEGacy Circus, and various aerial and ground works and creative audio description projects to make circus more accessible for the blind and partially-sighted community. Erin said that five years ago, she would never have imagined where she is today. "It has been the richest, most fulfilling years of my life.. and the hardest. I have learned so much and continue to every day. Today, I am proud to call myself a member of disabled community, and I hope that I can continue to represent on the circus stage, and get as many others to join me as possible!" Watch Erin's extraordinary story of survival and how she got back in the ring after losing her lower legs HERE. Luca 'Lazylegz' Patuelli has lived by the "No Excuses, No Limits" motto his whole life. Born with a neuromuscular disorder affecting the bones and joints of the body, he has undergone many surgeries to support his legs, hips, spine and shoulders. Luca has been dancing since he was 15 years old. He developed a unique dance style, taking advantage of his upper body strength. By using his crutches as extensions of his arms, Bboy Lazylegz was born! Combining his passion for dance with his knowledge of engaging the masses, he has become a strong advocate for inclusion and integration as he aims to bring people of all abilities together through the power of dance. Luca had me in tears when he talked about working with children who have more severe disabilities. He stressed the importance of observation, stating that when working with any type of ability, you have to be able to observe what kind of movement is coming out of the person. For example, a person with cerebral palsy may have very limited movement such as the opening and closing of a hand. "Someone might look at that and think, how are we going to integrate them, but this movement of the hand can be interpreted as a beautiful movement within dance. It is the slightest movements that make the greatest difference in a performance." To hear Luca talk about the amount of passion and energy that can be felt within those slight movements, hit me right in the heart. Thinking of my own child, who has very limited mobility and very few intentional movements, knowing that there is someone like Luca who recognizes that his movements can be purposeful and beautiful.. I was a mess. Luca, you get it, and I am so happy that you are sharing your insight with the world. Luca is taking his "No Excuses, No Limits" tour across Newfoundland, bringing his inspiring message of inclusion, perseverance, personal empowerment and overcoming adversity to audiences young and old from all walks of life. He has just visited four locations in the province, starting on the West coast and working his way East, with performances in Corner Brook, Stephenville, Grand Falls-Windsor, and Gander. He is now in St. John's and will perform at City Hall on October 3rd and at Easter Seals House on October 6th. Be sure to get tickets! You don't want to miss it! How awesome! You make a very important point that inclusion should be happening in a way that isn't a charitable mission type.